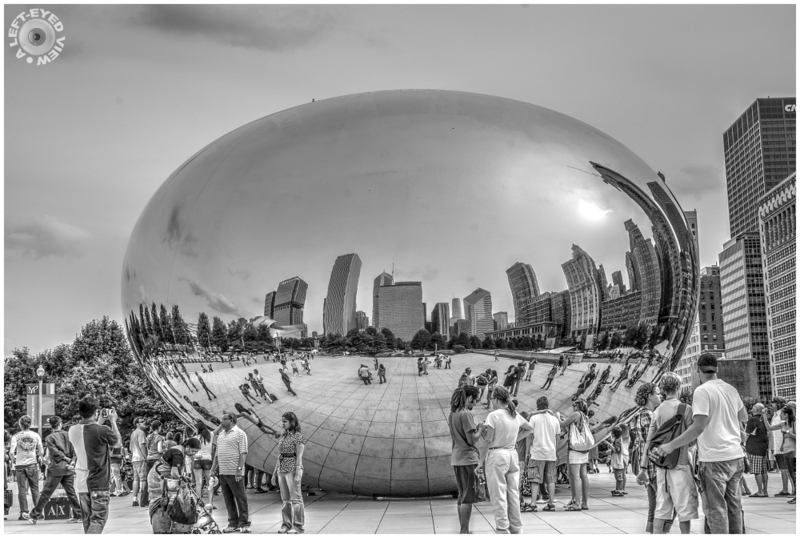 Steven (Chicagoland, United States) on 5 February 2015 in Cityscape & Urban and Portfolio. Cloud Gate is a public sculpture by Indian-born British artist Anish Kapoor, that is the centerpiece of AT&T Plaza at Millennium Park in the Loop community area of Chicago. The sculpture and AT&T Plaza are located on top of Park Grill, between the Chase Promenade and McCormick Tribune Plaza & Ice Rink. Constructed between 2004 and 2006, the sculpture is nicknamed The Bean because of its bean-like shape. Made up of 168 stainless steel plates welded together, its highly polished exterior has no visible seams. It measures 33 by 66 by 42 feet, and weighs 110 tons. Photo captured July 24, 2009. It seems a M.C.Escher job... Very interesting! Great effect! A very nice processing ! Well , very well done ! That must be one of the most 'successful' art installations ever . . I wonder if it was realized as such at the time. The Wiki page makes an interesting read. Fabulous and surreal image! Love the B&W treatment. Quels reflets et vue ces personnage les bâtiment superbe. It does look like a drop out of a giant broken thermometer. Excellent shot. What a super mirror this makes. I love those curving shapes being reflected in it. The B&W rendering produces a wonderful visual. A superb capture Steven.... and it does look surreal... perhaps the b/w gives it that feeling. Very nice indeed!! Neat sculpture and your image does it justice. I can just make you out ! A fabulous scene! I love all the people and the reflections! I have always wanted to see this sculpture! This is a wonderful work of art that you've captured nicely. Terrific shot of that amazing object. It must be something on a hot sunny summer day. Beautiful reflection and b&w processing! A excellent monochrome with marvelous reflections. Love it ! A fantastic feat of engineering. A well-composed image. That is great! What a set up for a photograph! Superb framing ! Beautiful photo . Excellent POV and intersting shot. Amazing !!! I so enjoy the photos of this icon ... well done!